I don’t know about you, but for me, every single holiday I have, I make big plans to do things I normally don’t have time for. I want to read the new medvis book, deep clean the house, finish unfinished games, dive into OpenGL and C++, bake more gamecakes, start regular yoga and meditation practice and about a million things more. I don’t know why having two weeks off tricks my brain into thinking I can do all of these things every time, because the truth is, I don’t do any of them. I always end up relaxing on the couch, gaming, sleeping and well, that’s about it really. Every single time! Then again, maybe it’s exactly what I need to restore my energy and come back to work refreshed. Recently, I was thinking about communication channels. I don’t know why exactly, but I just did. I’ve noticed I’m quicker to respond to things in my preferred communication channel (e-mail, blog comments) and much slower in others (phone calls, Whatsapp, Facebook messages). I think my main preference is to communicate via my computer and not my phone. I imagine everyone has their own preferred methods of communication profile and I’m wondering what the best way of dealing with this is. Should you make your preferences explicit and then expect others to use the ones you prefer? This would also involve getting to know the profiles of everyone else and contacting them in their preferred way. I guess the main feeling I have about all of this is that I’m overwhelmed with all the constantly open channels. I can deal with keeping up my inbox, but not at the same time staying on top of Whatsapp, Facebook, Google+, Twitter, LinkedIn and returning phone calls. Can we not find a way to redirect everything to one channel? In the ambient background noise department, I’ve found another fun one tool: mynoise.net. Not only does it have a vast collection of different noises, accessible right from your browser, it also has a calibration mode that checks your personal hearing curve, so you can adjust the noise generation for that. I also love the available presets per noise generating machine and that you can customize to your own preferences and then access from a single URL. This week I started working again after the holiday. After submitting to PacificVis, it was really a good time to reflect on the past and especially to contemplate the next steps in my project. For the latter, I think it’s beneficial to draw up a mindmap in order to explore the possibilities. I do this on paper first, but since I want to discuss this mindmap with my supervisor, I needed to clean it up and make a digital version. I used Mindmup, a free online mind mapping tool. It uses a ton of keyboard shortcuts and even helps you to get a nice-looking layout. I’m officially turning really old, because I have started to crochet a triangular shawl to help me keep warm in the autumn and winter. 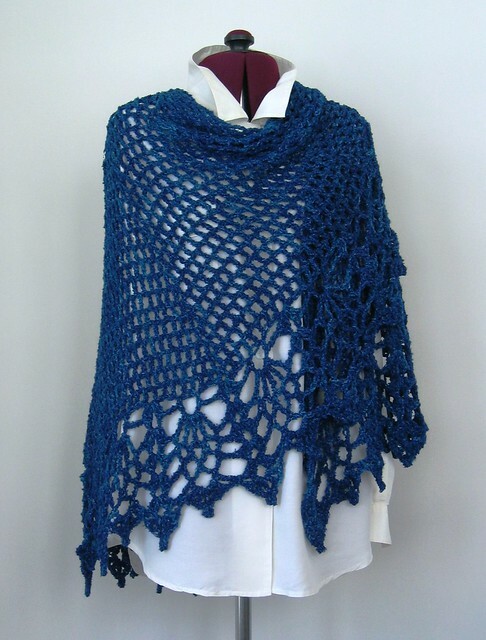 That’s right, crochet… shawl… It should look something like this when done, but in black and I would wear it in a different way. Before I even finished this one, I already have a vision for the next crochet project: a sequined sparkly peacock-tail inspired shawl. It will be fabulous. I think that’s about it for this week. Qapla’!